Traditionally, in Japan, kimono meant 'clothing'. Any kind of clothing. It's only been more recently that the word has started to mean the traditional Japanese robes worn to festivals with Oni (demon) dancers, vibrant colored weddings, and funerals. Today, we see all kinds of kimonos. Colorful silky robes, with beautiful patterns of flowers and mountain ranges. Vibrant blues and reds. Long wide sleeves. But, the colors and patterns aren't the only differences you can see. They also come in all kinds of shapes and sizes. There are the robes that are worn to weddings and festivals. These are the more traditional ones, but there are also short kimonos used for sleeping robes. But, we like the traditional kimonos the most. Their elegant patterns and sharp lines. Women in kimonos like this always seem a little more sophisticated and mysterious. 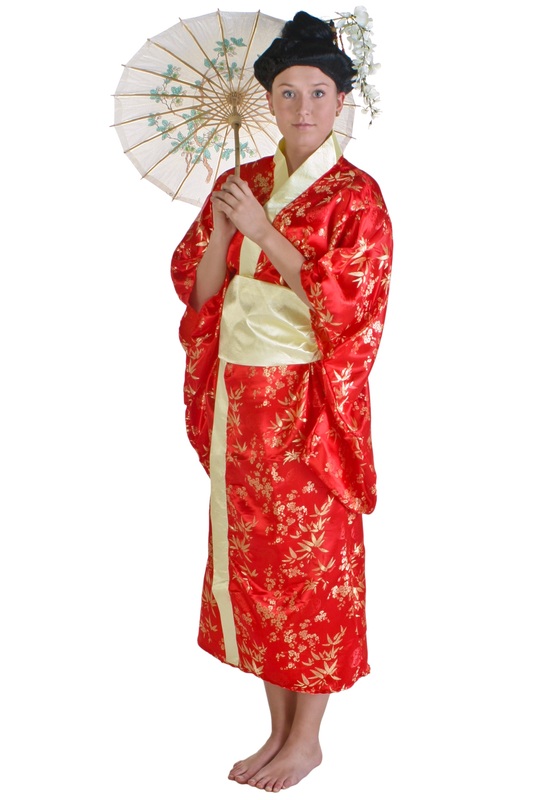 With this Women's Red Kimono, it is easy to picture yourself as a guest to a wedding, the bride wearing a white kimono with red accents, the groom wearing black with white accented robes. Or, walking down a Japanese street. Paper lanterns strung up on lines above the streets, casting a pretty red glow on the people milling about. Little shops selling trinkets, and delicious scent from the food wafting from the portable carts. Your Japanese language skills might need a little work, but it will be well worth it to see these amazing festivals. The red of your kimono matching the red of the Oni masks worn by the synchronized dancers.